One of the most memorable moments of your wedding day is walking down the aisle, so don’t settle for a basic, ordinary setting – decorate the aisle with a beautiful runner and add importance and symbolism to this life-changing moment. We often find that our aisle runners are lined with flowers, petals or storm candles which can really help to complete the look. 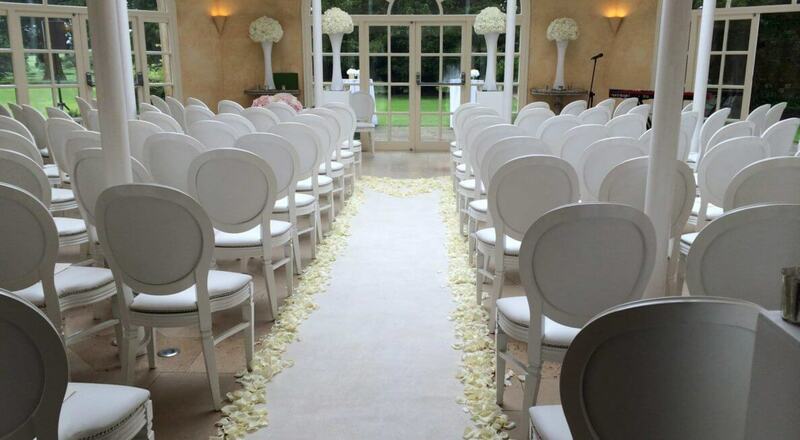 Our aisle runners are built to an exceptionally high standard, are finished off superbly, and are cleaned by hand after each hire to ensure that they look stunning when laid at your venue by our event crew. We have a variety of lengths of the white carpets in stock from 5m in length all the way through to 16m. If you need a bespoke size, just let us know your specifications and we will create a custom quotation for you. In addition we also offer red carpets, so you could walk down an aisle fit for a VIP. To find out more about our white carpet aisle runners, or to book one for your wedding, don’t hesitate to pick up the phone and give Premier a call on 0116 2029953, or simply send us a message. We look forward to hearing from you.